Annual color for a bright shady spot does not give you many choices. You are pretty much stuck with impatiens if you need deer resistance. Begonias work as do geraniums in bright shade, but for my money, coleus is the best choice for annual color in a shady spot. The foliage comes in so many different colors, ranging from greens and chartreuse, pinks and reds, creams and burgundy, purples and oranges. Who needs a bloom with so much color? You can grow the redder varieties in some sun and for a few years now we have grown Coleosaurus in front of the nursery where it gets late, and often hot, afternoon sun and it looks great. Dwarf varieties grow to a foot tall and the bigger large leafed varieties can get to two feet by the end of summer. They like regular water and high nitrogen food. Hate the idea that it’s an annual? Grow in pots on your shady deck or porch and treat as a houseplant in winter. You can also take cuttings before the first frost and grow/root them in water. Replant when the danger of frost is over. 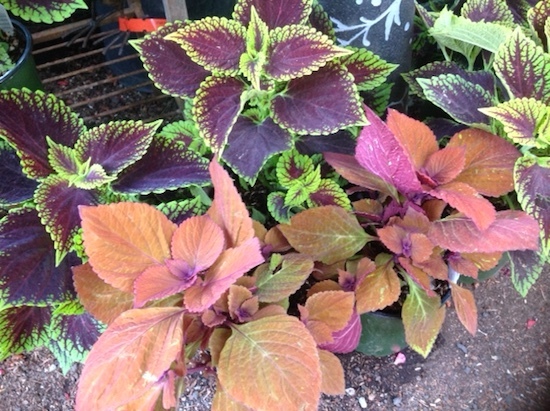 Although coleus is in the Lamiaceae family which includes lots of deer resistant plants, it is not on the Sunset deer resistant list. Hot one day and cold the next. I wish the weather would make up its mind. Reminds me of this winter. Periods of warm between periods of cool. We are hoping the warmer weather will put an end to the fungus issues. Powdery mildew has been worse than usual and our non-resistant pears and apples are showing signs of fire blight. I recommend Actinivate as a spray. 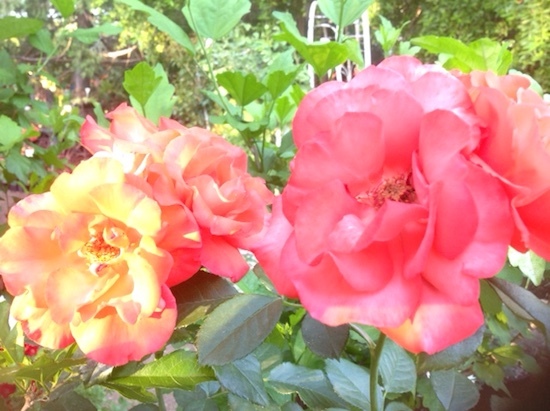 It is OMRI approved and seems to have worked better on the roses than the copper or the neem oil. It comes in powder form and you add water to make a concentrate. Aphids are another matter, usually bad this time of year on the roses but mostly cycle out of it. Here at the nursery we hose them off and release ladybugs. We are finding quite a few ladybug nymphs who eat four times as much as the adult. Make sure you know how to recognize them as years ago I had no idea that is what they were and disposed of them. Live and learn. Spring started a little later than some years but May was very busy. For those of you who had to park down the street on a few of the May weekends, you know what I am talking about. We still have a good selection of vegetable starts, melons only coming on in the past few weeks and the second crop of tomatillos are here. Japanese style eggplant and dark green zucchini have also been scarce but more are due to arrive this week. Also due are Casper, Baby Bear and Cinderella pumpkins, along with a pepper called Carolina Reaper. We have some Ghost peppers now. If you like Padron peppers you might want to try frying up some of the Takara Shishito style peppers. We had a request for Carmen peppers and have a source but they are not ready yet. Thai peppers came and went and we have not been able to get more. We were not able to get scalloped squash in till just recently. It might seem late but I have been too busy to plant my garden till the first of July on occasion and still enjoyed plenty of veggies fresh from the garden, but don’t delay too much longer. Time to refresh your containers with long blooming summer flowers. We had many requests for snapdragons and the drought is over. We are expecting them this week. Annual vinca has yet to show and that reminds me that I better check that Blooms still has it on their production schedule. 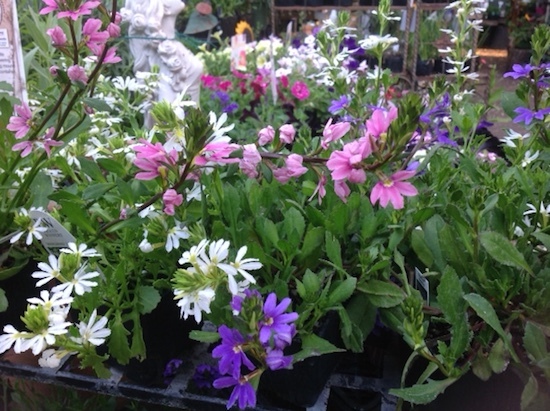 These annuals along with scaveola, lantana and portulaca are some of the most heat-resistant flowers available, but one of our suppliers no longer grows it. I just saw pics of some of the new vinca introductions in a trade magazine and want them. We will see if they become available. Zinnias are also in. Have you ever grown the little classic ones? We have them in 6 packs. They come in orange, yellow and white and are an excellent choice for us here. They bloom all summer with very little care. 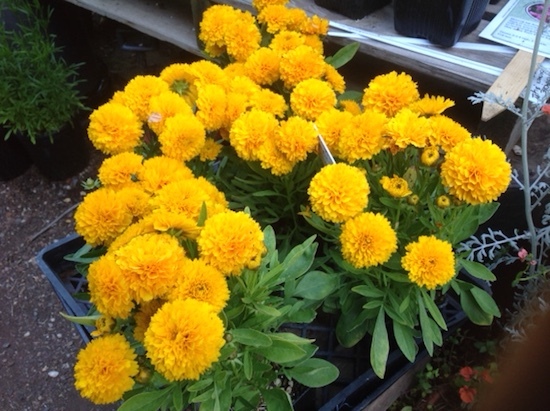 Marigolds are back in after two weeks in a row of selling out completely. Enough with annuals. How about perennials that come back year after year? If you are looking for something not so ordinary try the Cape Fuchsia. As with California Fuchsia these are nothing like your shade loving, hanging ones and are not really fuchsias as their common name suggest. Cape fuchsias are hummingbird magnets with their tubular flowers and are deer resistant and long blooming with very little maintenance in a sunny location. They grow up to two feet tall and spread by underground shoots. They come in a variety of colors, but I think we only have one color in stock as I write this. Each year brings new Salvia (Sage) introductions, so there is always something new on the sage table. Same is true of Coneflowers, although so far we only have the multi-colored Cheyenne Spirit and the traditional purple color in that we have had in past years. We have lots of Black-eyed Susans in 4-inch right now and somehow Indian Summer continues to outsell most all other perennials. Something about that large sunny yellow flower that keeps us coming back for more. Plenty of 4-inch lavender available now also, with several varieties to choose from. This might seem crazy, (it does to me), but I have already mailed off next years bare-root tree order. Our Dave Wilson rep stressed getting the order in early with L. E. Cooke closing so that is what I did. 2019 rose catalogs are here too and that is next up in the docket. Any special requests for bareroot trees or roses should come in as soon as you can to make it easier on all of us. Once your planting is all done, your new trees are wrapped or painted to protect from sunburn, the irrigation is up and running properly and everything has been fed, its time to get down a good layer of mulch. Mulch keeps your plants happier by holding moisture in and keeping the baking sun out of the root zones. Put down a thick enough layer and it will inhibit weeds or a least make them much easier to pull. Have you ever tried pulling a weed out of the hard sun-baked earth? Doesn’t work very well. I just can’t get behind bare exposed ground even if it is the fire-safe way to go. You will have to make that determination yourself and use good judgement. If your plants are in groupings with space in between as pictured in examples of fire-safe design, then you should still be able to mulch around your plants. You could always fill those mulch and plant free zones with rock covering. We have once again been dealt a trial by fire, literally. I for one am saddened by the loss of our Middletown Hardesters Market and wish them a speedy recovery. I can not quite wrap my head around the idea that I can no longer jump on my bike and run down to the store before we open for whatever my little heart desires. It is going to be a big adjustment for us townies. I hope we all make an effort to still spend our dollars locally, increasing business at the other two locations and perhaps allowing our friends and neighbors who worked at the Middletown store to be needed at the other locations. All the business’ here in town depend on each other in some way and our market was the biggest draw in town. We will all be affected in some way or another. The first First Friday of the season is June 1st. 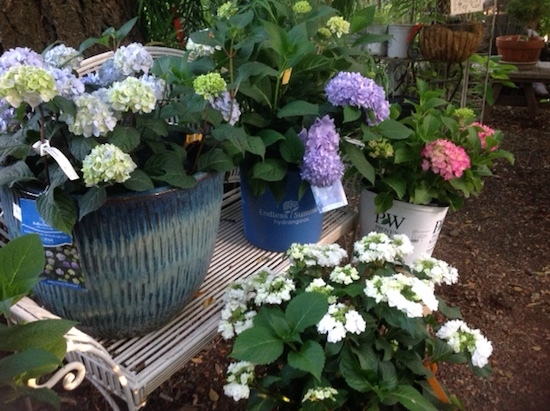 We are slated to have an artist, band and food vendor right here at the nursery from 6-9pm. We will be open for sales too. This newsletter might be out after the fact but if you miss this one the next one is July 7th, although I have not committed to having an event at the nursery for July, Aug and Sept. Its a good time to come out as a community for the evening. Events happening all through town, including a car show and farmers market. Shops open late. The first Movie in the Park is Saturday, June 9th. Beauty and the Beast. Starts at dusk but come to socialize before the movie. Our host, Mount Saint Helena Brewing Co. is planning on treat boxes for all the kids. This is a MAMA backed function and of course, yours truly is on the movie committee, hence the shout out on the newsletter. Summer-Fall - Open 9-5, closed Wed.
Winter - Open 10-4 Closed Wed.